Red Betty is an intimate bar and music venue with a speakeasy vibe that was conjured up on the site of Dane Certificate’s Magic Theatre. 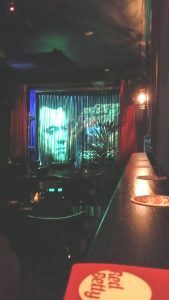 This Brunswick Laneway bar is a hidden treasure serving up delicious cocktails and a fine selection of wine, beers and spirits. Bar staff are friendly and the vibe is magic. Opening hours are 6pm till late Thursday, Friday and Saturday (entry via laneway off Cozens St.).